This week is going to be a bit of a rumbler. We have several rounds of stormy weather for the week ahead. This morning we are already picking up a few storms. They are across the Northern Miami Valley and moving to the northeast around 30 miles per hour so they will be moving out of here through the next hour or two. More storms later today and they could be strong to severe later with strong winds and hail possible. The chances are rather low for severe storms, but there is still a slight chance. More storms tomorrow and to the south, but these storms are not as likely to be severe since they will be during the coolest part of the day. I love stainless steel, it doesn't stain or rust. Haha, obviously. Well I did a check on my moped clutch. The oil smelt a little burnt and rightfully so because the new Motion Left Moped clutch brace was rubbing on the clutch bell a little. If you look at the outer ring you can see where it does not have the same finish as the rest of the brace. I also sanded down the clutch shoes just a little bit more so they engage slightly later and also will grab more surface area when they do. For having about four hundred miles on them so far... not to shabby and the aftermarket clutch shoes are holding up and haven't broken loose yet. I would LOVE to have a tachometer to see what kind of RPM's I am grabbing at and reaching at full speed. The other stainless steal advancement is my collar stays. I was rocking the plastic collar stays that come with the shirt, but finally broke down on eBay and found a great deal on a set of 5. No chance of these bad buys bending... and if they do, and that is a big if, I can easily straighten them back out. So far, I am loving them. As mentioned, storms this morning, a break midday, and more storms later today. The storms later will have the threat for strong winds and hail, but only a slight chance. More storms tomorrow and then things slowly try to wrap up heading into the middle of the week with a lingering shower possible Wednesday. We dry out briefly before more storms later Friday and into next weekend. The reason the week will be so stormy is because the jet stream is sitting over Canada and not moving our wet weather away. Instead it will help keep storms moving through from the west through the week ahead and keep us warm. Today and tomorrow we will get into the upper 70's and then low-mid 80's for the middle and end of the week. We will slightly cool back off in the upper 70's for next weekend. We will see dry spells between the storms, but keep the umbrella handy and have a good one! The NFL Draft is a magical time. College players get their dreams to come true and make it into the NFL. 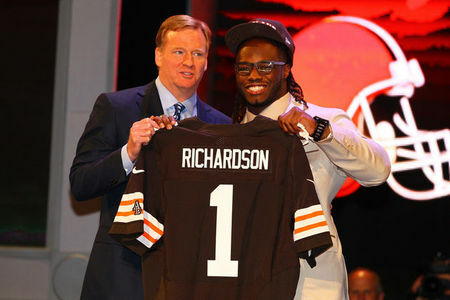 However I was a little surprised at what the Browns gave up to move up one spot in the draft. The Vikings were sitting pretty in the No. 3 spot overall, but they were rumored to have a few trade offers on the table so other teams could get Trent Richardson from Alabama after Andrew Luck and RGIII go number 1 and 2. From what I understand the Vikings came to the Browns and tried to see if we could sweeten the pot compared to other offers. By offering a switch to get to No. 3 overall to No. 4 overall AND our offering fourth, fifth, and seventh round draft picks...we really showed that we wanted him. I am happy with the move because we need a solid running back since Hillis went running away...good thing he was healthy enough to run away. I am also happy we picked up a QB, Brandon Weeden from Oklahoma State, with our 22nd pick later in the First Round, but I think we need a few other key positions. We already have Colt McCoy and it is interesting that we went for a QB that early. We need to draft a WR and OL pretty bad so I am excited to see what kind of progress we make today. Either way I am excited about this year's progress already... even though we are months away from pre-season. The forecast is up and down for the days to come...well maybe down and up would be more fitting. Today we will remain dry with a high of 57 and sunshine slowly giving way to more clouds. Light rain showers arrive overnight into Saturday. The rain showers will be on and off for Saturday with the best chance for rain in the late afternoon into the early evening as the system starts to exit. There will be a few dry periods throughout the day so not a complete wash-out. I think for Saturday we will reach a high in the mid 50's and near 60 for Sunday with drier weather. Monday will be the nicest day for the week ahead with highs in the upper 60's and partly cloudy. Rain returns for Tuesday through Thursday with scattered showers and storms, BUT highs will be in the upper 70's. I will take that trade off. Keep the jacket handy this weekend and umbrella for Saturday and have a good one! There are a few morning showers and storms currently. They are moving their way across the Northern Miami Valley and will be out of here by this afternoon. There also is a little fog currently as the winds are switching. This afternoon we will have a little clearing and it will be breezy with temps in the 60's. There is a Freeze Watch already issued for some of the Northern Miami Valley for Friday morning. High of 56 for Friday with partly cloudy skies before rain showers arrive late Friday night into Saturday. Saturday will be chilly with a high of only 49 and on and off rain showers. We dry out by Sunday and slowly clear out heading into the start of the week. Monday morning will have a low near freezing, but that will be a hick-up in a warming trend: 57 for the high Sunday, 67 Monday, and then low-mid 70's for mid next week. Rain will return then as well, so at least a few dry days ahead. Back to the news... dealing with these storms. Stay dry this morning and have a good one! 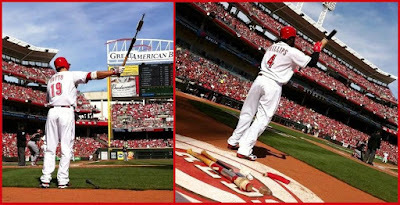 Oh yea, I put this short video clip together from my trip to Louisville over the weekend. The beginning is a little slow because I wanted to get video of the entire pack so everyone could try to find themselves in the video... the last thirty seconds are pretty quick, so brace your eyes. Had a blast. Thanks Bandits. Our main threat will be damaging winds with most of the Miami Valley under a 15% chance for severe winds (60+ mph) within a 25 mile radius. The best chance for stronger winds will be to our west and south. West and south are also the best chance for hail. We are also within the 15% chance for severe criteria hail, which is 1" diameter or larger. Both the wind and hail are nothing too crazy and we normally see these kind of percentages with spring/summer thunderstorms. 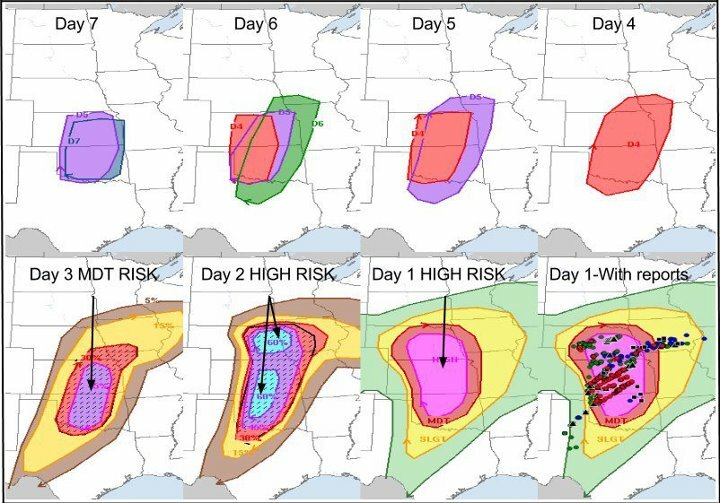 The one thing we need to keep an eye on is our chance for tornadoes. We are only in the 2% shaded region, but earlier this spring we were in the 2% chance and sure enough we had two tornadoes. It is not a direct correlation, but will need to be watched closely. 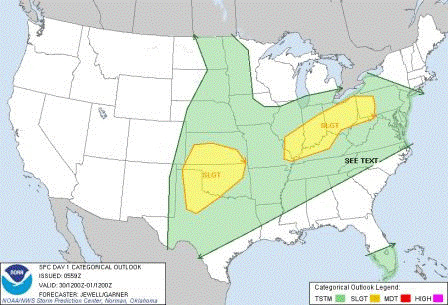 The ingredients for widespread severe weather is not perfect today. The storms will arrive in the late afternoon and evening. They will move out of here overnight with maybe a lingering shower early tomorrow. The good news is that today and tomorrow will be warm in the upper 60's. Things will cool off for the weekend with highs in the mid-low 50's. The next round of rain is set to arrive Friday night into Saturday. We try to warm up a little early next week, but more rain late Monday into Tuesday. So a pretty wet week ahead, and our best chance for dry weather will be later Thursday into early Friday and then later Sunday into early Monday. Keep that umbrella and NOAA weather radio handy. Have a good one! With the recent rain, cooler temps, AND the fact that we are getting into the end of April... the tree pollen is the lowest it has been since early March. 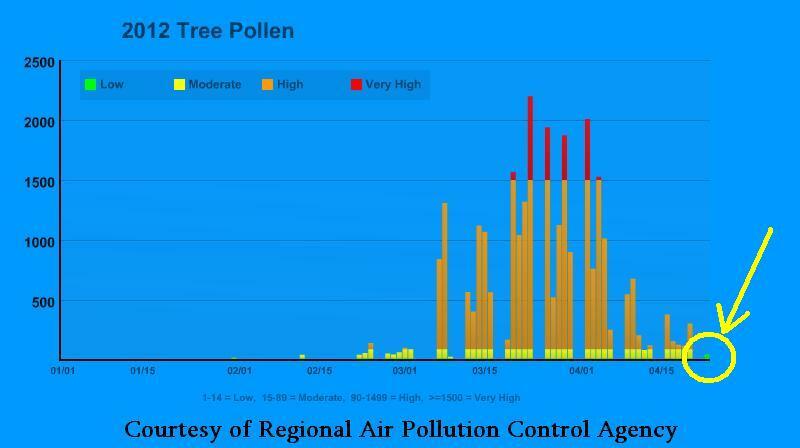 Tree pollen started jumping in early March and we are finally getting on the backside of spring-time allergies. The only downside to that is that summer allergies are right around the corner with grass. 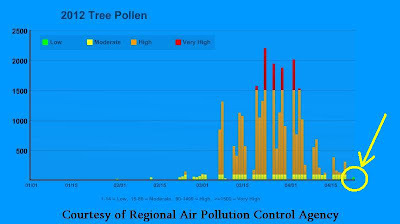 Our pollen count yesterday was only 48, which is very little compared to when we topped out around 2200 this spring. Personally I really only get hit hard the start of the season so late February and and very early March. In case you were wondering ragweed is fall allergy season, so we have a while before we deal with that. For any of you spring allergy suffers though...today is a great day! Almost in the clear. The extended forecast is looking rather wet so we will be keeping that pollen count low. Today we will see clear skies with more clouds by the afternoon, high near 60, and breezy. Tomorrow and Thursday we will get into the mid-upper 60's with rain arriving late Wednesday and that will stick around until early Thursday. We could have a few strong storms Wednesday night. Drying out briefly but more rain later Friday that will last through the weekend and with cooler temps during the second wave of wet weather with highs in the mid-upper 50's. We will warm up and dry out by Monday, but we will be right in the line of fire for rain for several days. Enjoy the sunshine today and have a good one! Always a great feeling when you finish a moped rally with no problems with your bike. My bike rode great the entire time, with a minor scare on Saturday. I ended up running SUPER hot coming up a mountain side south of Louisville. I almost feel when I start going up hills or put an excess amount of pressure on the motor I get an air leak because the temperatures spikes fast and hard. I was running about 250-275 consistently until the hill and then I hit 452 degrees....YIKES! I immediately jumped off the bike and walked it, then rode it, then walked it, then rode it to finally get to the top and join the rest of the group for lunch. I am pretty sure I have some minor smearing on the inside of the cylinder from the aluminum piston, which is good because it will fill in the low spots after my clean-up and seize a week ago. I said this may be a good thing because riding back after our halfway stop the bike was running CRAZY awesome. Bike ran great the rest of Saturday and also on Sunday. We crossed the river to get some ice cream and all of the Dayton riders still around took advantage of the location and got a picture of the five of us still there. Crossing the bridge I was running super fast once I got onto level ground and could actually open-up... and staying cooler than 300 degrees. We had fourteen people total from Dayton go down, so we had a great showing. Only one of the guys broke down on a bike that has been reliable and never touched for ten years. I am not sure the official count of all the mopeds, but my guess was easily over 200. The Bandits always offer uncomparable hospitality and continue to make their moped rally my favorite. Solid 80 miles of two wheeled smiles. Temperatures were definitely cooler over the weekend, but sadly, not warming up a lot for the week ahead. Today we will warm back into the mid 50's with partly cloudy skies and a chance for frost tonight with a low of 33. Tomorrow we will warm into the upper 50's with a little more sunshine, but clouds return quickly on Wednesday with rain returning later in the day and into Thursday. At least we will be in the 60's for the end of the week, but another cold front next weekend will cool us off again and bring more rain...right now looking like Saturday for that chance for rain. So keep the jacket handy and have a good one! It is hard to believe that ten years ago today I joined the working force. A few friends, at my church, worked at the local restaurant in a town that had less than 1000 people... I think they still have less than 1000 people living in New Madison. Anyway, I was helping my dad clean roots clogging drainage tile on the farm when I got the call that they needed help. I was super excited. I had no idea what to wear on my first day at the Historic Fort Black Buffet, so I threw on my khaki pants and my favorite sweater...too bad that was their last use. I had no idea I would be using so much bleach to clean things...they were ruined. Fort Black was the local greasy spoon known for their 15+ different pie selection. Man, I loved their food. I worked there until I went to college and it was probably one of my favorite jobs; and I have had about 16 jobs in the last ten years. I often held several jobs at a time while going through college to keep from being weighed down with student loans. Anyway, I always remember that I got my start at the local restaurant, which I just found out recently that it has shut down. Bummer. 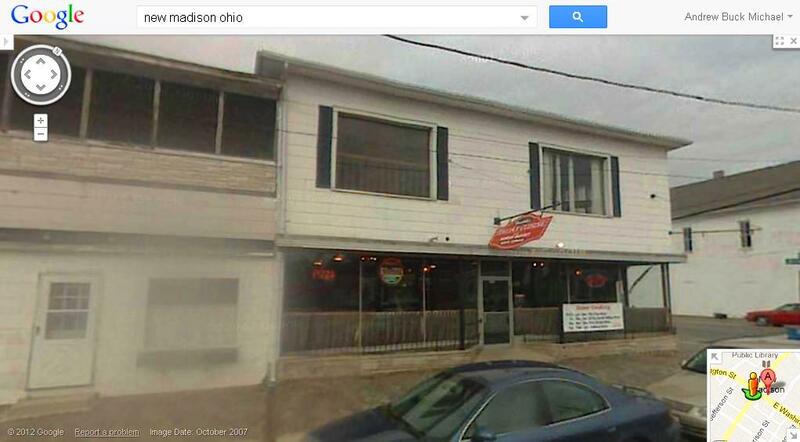 I tried finding a photo of the restaurant online, but had to resort to a Google Street View. Forecast is holding solid from yesterday. Today will be warm with highs in the mid 70's and then storms arriving around dusk this evening and will likely be at their strongest and affecting most of us around midnight or shortly before. There is not a major threat for severe weather, if anything, only strong winds. They will push off to the east and by daybreak tomorrow we will begin to dry out. The good news is that other than the rain tonight, the weekend will be dry, but the bad news is that it will be considerably cooler. Highs will be in the mid 50's for the weekend and early next week. Frost is also likely with lows near freezing for early next week. We will warm up heading into the end of next week and still looking like no decent chance for rain until late next week. Enjoy the weekend and stay dry tonight. I will have plenty of photos from the moped rally when I get back, so check back in on Monday. Have a good one! 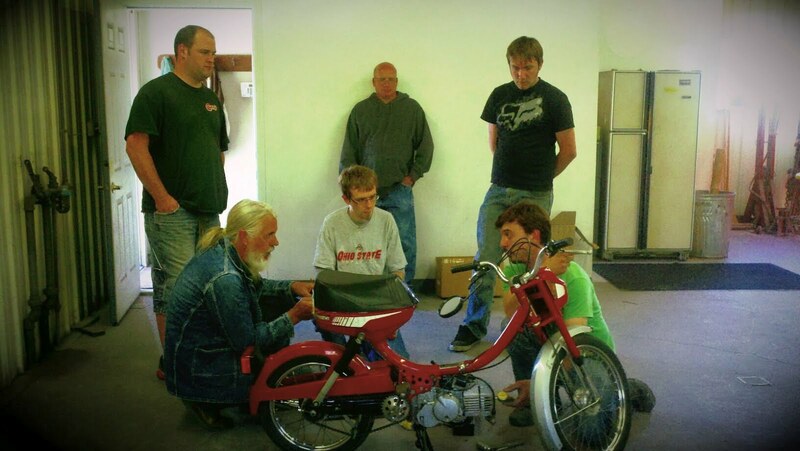 We had a last minute test and tune to get everyone's bikes ready for the moped rally this weekend in Louisville. It was so nice I decided to get some things done around the house and then ride my moped to Middletown for the meet since my bike had no big issues. A few people did bring their bikes that needed tuned, but hope that by the fact that there were only a few people...the rest of the group is solid and ready to ride. We will find out. Bike ran great and I was able to keep up with traffic most of the time. I did adjust the timing before riding down and it rode cool for a while, but I think it may have slipped a little bit advanced since it started running slightly hotter later. I will check it again today to be positive the stator didn't walk forward. The big issue for others yesterday was the timing. Nick has some amazing tools for timing the points. He was giving everyone a Timing 101 lesson. His ignition timing gauge is crazy accurate and something I would love to look into getting. I can closely check my timing, but not down to the thousandth of a millimeter. Only problem is that the stator will move on you anyway and slip. Set it, blast it, recheck it. I am very excited for Whiskey Business this weekend. 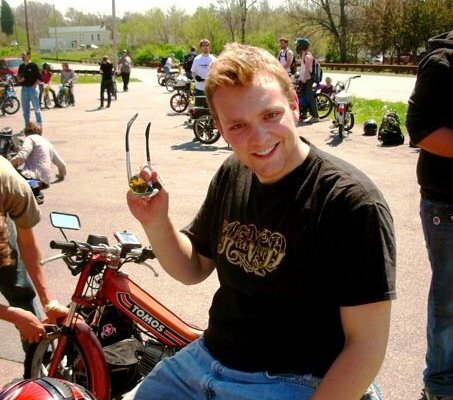 It was the first moped rally I had even been to three years ago and it holds a special place in my heart. Weather here and for Louisville will be similar the week ahead, well, maybe a little warmer down there. For the Miami Valley we will get into the mid 70's today with partly cloudy skies and same for tomorrow with storms arriving in the evening. Friday will be a little breezy as well. The storms will arrive around dusk Friday and likely kick out of here by daybreak on Saturday. That means that the daytime hours will be dry on Saturday and Sunday, but cooler with highs in the mid-upper 50's. We will slowly warm up next week and still no decent chances for rain for a while after Friday night. Back to the show...so crazy busy this morning I still haven't had my coffee three hours into the shift. Have a good one! With the school year wrapping up, my school talks are starting to dwindle down as teachers try to get their needed content in the curriculum, but I was lucky enough to visit Favorite Hill Primary Elementary school in Piqua yesterday. 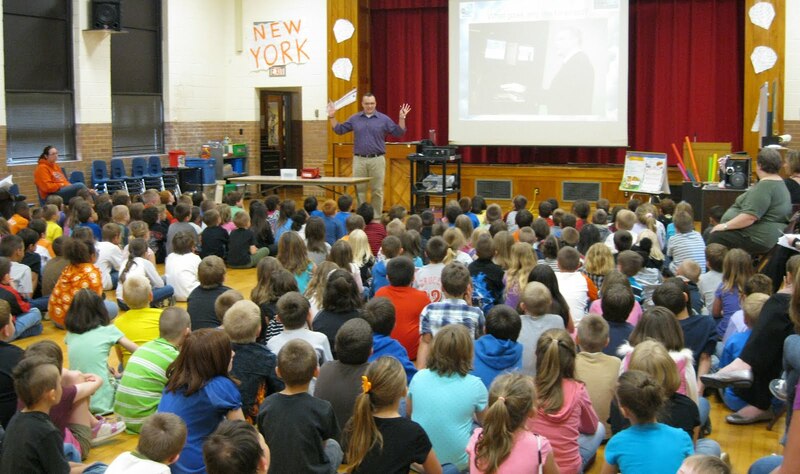 I talked about the weather and my career to the third graders a few weeks ago, but yesterday I talked to the first and second grades. The students had great questions and even one of the teachers raised her hand to join in on the fun. It still amazes me how when one student ask a question how the other students cling to that topic...so yesterday's questions were a lot about weather balloons. I checked my schedule and only one other school is scheduled before the school year wraps up, but if there are any other schools out there interested, feel free to let me know! After my blog yesterday I looked at the count and it was my 600th blog entry. That is crazy! I started this just as a way to daily keep track of my forecasts, happenings, thoughts, and jokes...but it seemed to have really taken off. I want to thank all my readers for following and leaving their comments. I love hearing back from all of you. Last week I actually copied my entire blog into Microsoft Office to see how many pages it would fill.... 450+ pages!! Craziness. So, again, thanks to all my loyal readers. On to the weather... coming cold front is still slowing down... which is better news for us for the next few days. We look to stay dry until late Friday, maybe not even until the overnight hours into Saturday, will we see rain. So a mix of sun and clouds today, Thursday, and then more clouds by Friday with highs slowly warming up...68 today, 73 Thursday, and then 75 by Friday. Then the rain arrives, which will cool us off. Saturday scattered showers and storms so not a washout, but only a high near 60. We will start to dry out Sunday with a high in the mid-upper 50's and then warming up back into the 60's for the start of next week. The models have been hinting at a couple weak systems early-mid next week, but so far nothing that impresses me and nothing I would hold a candle to yet. So right now our only chance for rain will be late Friday, Saturday, and then maybe early Sunday. Wish it wasn't over the weekend, but at least it is another great reason to throw on some sweats, pick up some Chinese food, and catch up on movies on the DVR, haha. Have a good one! It is always important to give credit where credit is due and the Storm Prediction Center with the National Weather Service knew that Saturday's storms were going to be pretty nasty, a week out. There were a lot of factors coming together, but the key part was the jet streak within the jet stream, and sure enough when that arrived into the overnight hours, BOOM. A jet streak is an embedded region within the jet stream that has winds much faster than the rest of the jet stream. When this rolls through the upper atmosphere, it can add extra lift, rotation, and ultimately more instability. SPC had been calling for the chance for the storms a week out and kept with the chance for severity. It is just amazing how much more accurate the forecast has gotten over the last few decades and even years... if only we could get rid of the negative stigma. I think I heard three more "weather man" jokes over the last few days. I laugh and nod my head, but think to myself... "If I wanted to be 'wrong' and get paid A LOT more, I could have been a due-date doctor for expecting mothers.... I think they only get the date correct 4% of the time...." Haha... oh the things that go on in my head... Anyway... I thought I would share this and offer my kudos to those at SPC and all the hard work they put into the forecast over the last week. The winds are just slightly strong for fog this morning. If the winds would be under five miles per hour then we could start to see a little fog, but winds are about seven or eight miles per hour. Mix of sun and clouds today with a high of 63 and then much of the same tomorrow as we get into the upper 60's. Partly cloudy Thursday warming into the low 70's and low 70's again Friday before rain arrives later in the day. The system is slowing down a little so we could be dealing with more rain on Saturday, but I am hoping the system doesn't stall out and leave rain on Sunday too. The models have been hinting at the possibility of that happening. Temps will cool down to near 60 for highs for the weekend and early next week, if not slightly cooler. Well, back to the show. Have a good one! My entire weekend was great. 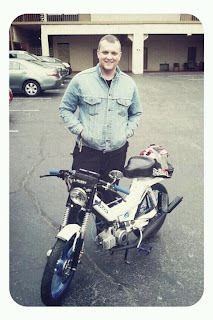 To finish off the weekend I finished a 35 mile moped ride Sunday with the moped that was down for the count on Friday. I guess we should start with Friday... HUGE NEWS! 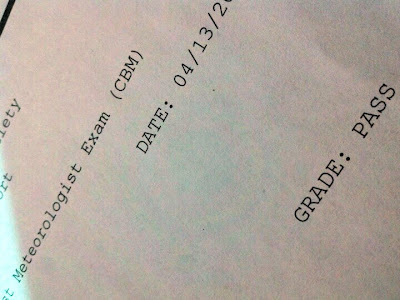 In my blog I have been talking about studying since last Fall for the Certified Broadcast Meteorologist exam. I took the exam in late December and the test was not only a test examining my knowledge, but my riddle skills by some of the tricky wording. 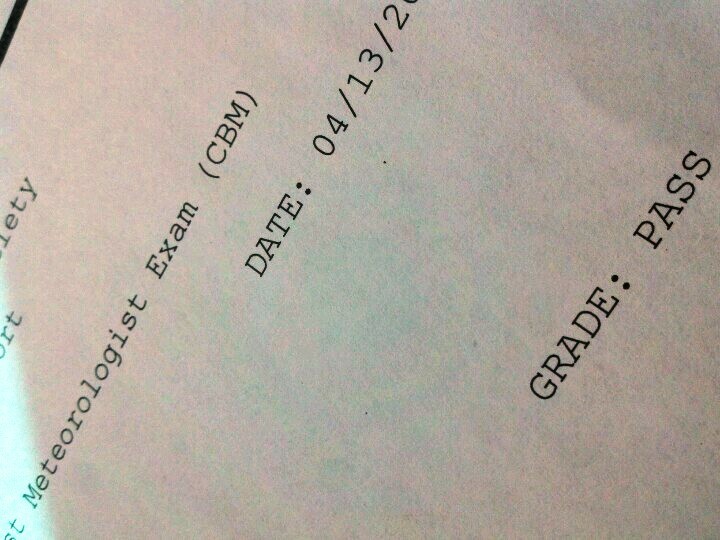 I barely didn't pass in December, but I took the test last Friday...the 13th... and PASSED! WOOOT! The topics I really hit hard the last two months studying were barely on the new exam...(new questions), but at least I passed it. So happy to have that done and over with... now I need to send in three video forecasts for the American Meteorological Society to critique, but from what I heard, they only approve about 50% of people the first round of videos.... and it takes close to 6 months to hear back before resubmitting, so I don't have my CBM seal just yet, but it is only a matter of time. Dawn's company had a VERY successful March so we had planned a dinner with her boss, which is her cousin, his wife, Dawn and me on Friday. It worked out great because we celebrated my test as well. Had a great time down in Cincinnati and somehow I may be treating next time when I get my CBM seal... not sure how that worked out or if that is true. Saturday was a pretty laid-back day since it was so wet and rainy all day. Dawn went up to Columbus to spend the night with her aunts and watch her cousin play in a basketball tournament. I visited my friend in Middletown at his car shop because he has some of the good ol' strong muriatic acid, aka hydrochloric acid. They only sell diluted versions now at masonry stores, and I needed the strong solution for my seized cylinder and piston. I need to pick some up for myself, but that stuff is VERY dangerous. We used it to eat the aluminum on the inside of my cylinder and it bubbled away the smear. It cleaned up GREAT compared to the photos from last Friday's blog entry. We also talked about issues and problems with some of the high compression heads and the fact that their curvature is very harsh and not conductive to proper running so I spent the afternoon sanding down the aluminum head by hand. I taped off the seal on the head and used an old spark plug in the middle to keep from sanding the threading. Much smoother and will now disperse the combustion more evenly instead of directly back to the center of the cylinder. I finished that up and went to a friends birthday party in Xenia. It was a lot of fun hanging out with my moped friends with no moped riding or wrenching involved...yet. 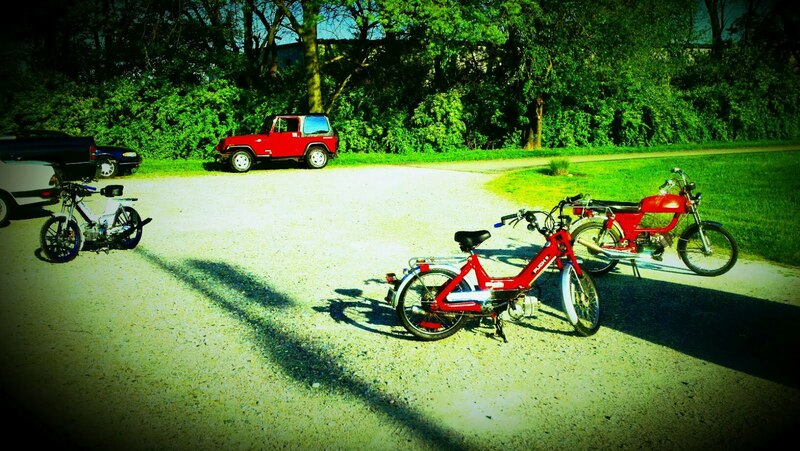 Sunday I woke up, mowed the grass, finished the sixth load of laundry then went back out to Xenia for our moped ride. We grilled out beforehand and it was delicious! It was about a 35 mile ride and the guy leading the ride actually was the only one who broke down. His chain broke a few links away from the master link so his girlfriend came and they put the moped in the trunk of her car and finished leading the rest of the route. My bike's spark timing, set to 1.3mm BTDC, may have slipped a little because I was running pretty hot temperatures by the time we got back home compared to riding earlier in the afternoon. I also need to repack bearings in my front forks because I didn't put in a spacer above the top threaded nut to hold it solid... I thought I wouldn't need it, but the vibrations of the bike rattled it loose and I lost my bearings...haha. I need to find a local place that sells some 3/16" loose ball bearings. Other than that, bike held solid and is ready for the rally next weekend in Louisville. I came home and Dawn had dinner ready and we hung out for a few hours before I went to bed to start the workweek all over again. Great weekend and wished it could have lasted longer. Forecast is looking pretty good for the week ahead. There will be two wet spells and the first is early this morning. Showers are moving into the Ohio Valley currently and will be off to the eastern part of the area by lunchtime so you will need to brace for the windy, wet morning commute, but later today it will only be windy... not wet. Skies will clear out tonight and winds will calm down. Add in the fact that there will be moisture left over from today's rain and we could be dealing with fog tomorrow morning if the winds calm enough. Mild and dry for most of the rest of the week. Mostly sunny and 63 for the high Tuesday, 67 and mostly sunny Wednesday and then clouds start to return. Warm on Thursday with a high of 71, but partly cloudy with rain returning Friday and a high of 66. Next weekend is looking dry, but cooler with highs in the mid 50's and even a chance for frost for the overnight hours. All in all, a pretty nice and dry seven day forecast after midday today...other than Friday. I will monitor any changes for the week ahead so stay tuned and I will keep you posted. Have a good one! The white moped, my Puch Maxi, is down for the count. I thought I had enough miles on it to plug chop and check to see if the proper carb jet was in there. The Polini was four-stroking at wide open throttle with a 90 jet in the 15 Bing so I was running an 88. Bike was riding dreamy as I was on my way to the long stretch of road I wanted to use to plug chop. I switched the spark plug, let it cool a little more, then hit the road. Bike ran great, the expansion chamber pulled strong through the upper 40's and then ZING! Seized. I pulled it over onto the bike patch, tried looking in the spark plug hole to see if it was the classic Polini seize on the exhaust port... nope. Luckily I could still turn over the motor when I pedaled and pulled the clutch, so it was not a hard seize. I upjetted to 92 and four-stoked the motor all the way home to keep the motor cool and lubricated. I probably should have left it there, walked home, and came back to pick it up, but ehhh, I only went out to plug chop cuz I was burnt out on studying and had to get back home for more studying. Luckily one of the guys in the group has been running Polini kits on his bikes for over 10 years so he is going to help me clean up the cylinder with muriatic acid. Toss on a new piston ring, but the piston will be a little more work. Nick said he has had the same problem on his Magnum and after a little clean-up it is working great for him now. I was running 1.65mm timing BTDC, which is pretty aggressive, so I will need to back that off to about 1.25. Long story short... I need to figure out what I am taking to the rally next week... stock cylinder?!? Maybe. The next thing that happened is my dress shoes. I was here running around work and my sole came off across the front quarter. Pealed right back. Luckily I am rocking my flip-flops I have on standby in the weather center, but my shoes are super-glued, and I put them in a vise in the engineering back room here at the station... I am just hoping that is the last of the bad luck. Quick look at the forecast. Today we will see slowly increasing clouds, but plenty of sunshine this morning. We will top out in the mid 60's today, then 70 tomorrow, 77 Sunday then cooling heading into next week, mid 60's. Light rain showers tomorrow on and off with a chance for an afternoon storm or two. We will dry out for Sunday with partly cloudy skies and then more rain Monday. The cold front will roll through Monday which is why we will cool off, but will at least bring us another chance for showers and storms. Today and Sunday looking like the best days for the weekend. Enjoy the warmth and have a good one! 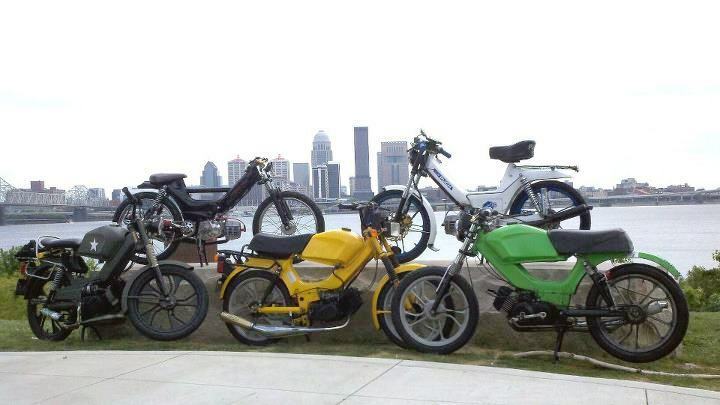 It has been three years since I was riding my moped around the glorious city of Louisville. I love attending their moped rally, Whiskey Business, put on by their moped branch, Bourbon Bandits. I also love the Bandits. They may not be known to build the cleanest, shiniest bikes, but boy can they make some fast, fun, furious mopeds. So if you are heading down there for Thunder Over Louisville, the largest fireworks and air show in North America, be on the look-out for a few hundred mopeds flying by too. You may catch me with a grin from ear to ear. The weather right now is a little iffy next weekend for the moped rally. The forecast models are showing a chance for showers and storms next Saturday, the 21st. I will be keeping a close eye on that in case the rally will come with rain. Closer to home, here in Ohio, we are dealing with temperatures just below freezing again this morning. The good news is that with plenty of sunshine we will bounce back into the upper 50's later today and then mid 60's tomorrow. Rain rolls in early Saturday with a few showers and storms. Temps will be topping out in the 70's for the weekend, but we will deal with a scattered rain on Saturday and maybe a lingering shower or two to the far north Sunday and Monday. The system will pull back south on Tuesday bringing another decent chance for rain, but then drying out by Wednesday and cooler with highs back in the mid 50's. Are the Reds the new Yankees? On to the weather... great ready for a cold morning. Temperatures have dipped down to 28 at 4AM at the Dayton International Airport which would be the coldest in over a month... we dropped to 22 March 10th. We will warm up into the low 50's today with a mix of sun and clouds with more sunshine tomorrow and warming into the upper 50's to continue our warming trend. More clouds by Friday with temps into the mid 60's and then 70's for the weekend...BUT rain returns. Scattered showers and storms this weekend. The system slowed down a little so later Saturday and Sunday looks to be the best chance for a scattered storm this weekend. They will stick around until Tuesday as the system kicks out of here followed by cooler weather for the middle/end of next week. I guess enjoy the sunshine before the wet weather returns. Have a good one! After our March ended up 13 degrees above normal...it has been a LONG time since we have been much below normal and today and tomorrow we will be below normal by about ten degrees. Tonight we will see temperatures fall a few degrees below freezing so out of all the nights we have warned about frost and freezing temps killing plants, tonight will be the worst since "spring" began last December. Sheet, blanket, newspaper, but no plastic touching the plants. The good news is that we will slowly warm back up above normal by the weekend, but we will have to trade that off for rain. The best chances for rain will be later Saturday and into Monday with a little break Sunday. We will cool off again for the middle of next week, but not sure it will be quite as cold as today, tonight, and tomorrow. Other than maybe an isolated shower today we will stay dry until the weekend, so not too bad of a week, but ehhh, it's April and Ohio. It could be a LOT worse. Gotta get back to the grind, but just thought I would pop on here a little early for a quick look at the weather. Have a good one! Not many people consider yard-work fun, but power washing things is a BLAST for me. Dawn and I went up to her parents this weekend and I got to power wash the back patio where the dirt had built up over the years. It was amazing how the concrete appeared to be clean, but after a little soap and soak it really took off a lot of the dirt and build-up. The job took a few hours, but I had a lot of fun cleaning the patio and getting out the patio furniture while everyone else was getting ready for the 100 year old birthday party later. Dawn's grandfather passed away about thirty years ago, but her father's brothers came over and they shared stories and photographs. The stories about life back in the early 1900's was amazing and so were the stories about the military life from then. Imagine being overseas for nearly four years and never coming home. It is amazing what people did and sacrificed to ensure we remain free today. It was a great weekend and the weather was even better. We will still be mild today with a high in the low 60's and a stray rain shower possible. Same for tomorrow with a stray shower possible, but much cooler temperatures with a high only in the upper 40's followed by freezing temperatures Tuesday night. We will dry out for the rest of the week and slowly warm our temperatures back into the 70's for next weekend, but trading that for a chance for rain. Saturday looks like our best chance for rain with maybe a lingering shower Sunday, but we will keep an eye on the timing of that as it gets closer. Stay warm for the middle of the week and enjoy the mild start. Have a good one! While I have been working on my moped build I have been consulting a lot of the crew here on the morning show. The director and production tech have been weighing in and we have had some in-depth conversations about the bike as I have been rebuilding it. Our director is moving on to a sales job here at the station so today was my last chance to bring in my moped and let the crew see it in person(before it got dirty from all the riding I have planned). I figured while it was here I might as well get a photo of it in front of the weather center since I had my forecast done and ready to go. Well it is definitely a chilly start to Friday. Temperatures are at or just above freezing, here at 5:30AM. We will likely start warming after sunrise at 7:12AM today, but we will see the temperatures drop a few more degrees over the next two hours. Wall to wall sunshine for the day today with highs in the upper 50's followed by more freezing temperatures overnight but mid 60's for highs for the weekend. There is a very, very slight chance for rain showers Sunday and Monday, but other than that we will be dealing with a dry week ahead. Temps will cool back into the mid-low 50's for the middle of next week with more frost likely, but hey.... the Easter weekend is looking pretty nice. Cheers for Friday! Have a good one! I used to love Daylight Saving Time. Used to. The sun would set later and there is more daylight for fun outside. Now that I wake up at 1:15AM in the morning for work though...well, this has changed my thought process on DST. During winter I would try to get to bed around 7:15 PM so I could get 6 hours of sleep if I fell asleep as soon as I hit the bed, which never happened. Well now that the sun is up later I keep pushing back the time I try laying down. Yesterday I was crazily tired and after going on about four or five hours of sleep a night for the last couple weeks, I finally decided to take a nap. I laid down on the couch yesterday, turned on The Office, and I was out like a lamp for four hours. Of course that meant that I didn't get to bed until 9:30 last night, but at least I did get some sleep to make up for all my "daylight-soaking-in." I hate sleeping during the middle of the day, but at least I get to spend the evenings with my wife if I do nap in the afternoon. Despite all the extra sleep, I overslept six out of my seven alarms this morning. I have a seventh on my phone to tell me to get out the door at 2:10AM and that one actually got me out of bed. Didn't stop moving and was ahead of schedule by 3AM. Gotta love frantic mornings, but things are much calmer now. I started walking out the door this morning and then turned around to grab a jacket. Temperatures are in the low 40's and upper 30's so it will be a cool start to the day. This afternoon will not be a lot warmer as we only top out in the mid 50's with slowly clearing clouds. Overnight lows for Friday and Saturday morning with near freezing temps so you will need to cover up the plants across the Ohio Valley. Highs will jump back into the low-mid 60's for Easter weekend and rain only a very slight chance on Easter Sunday. A slightly better chance, but still a small chance, for rain will be Monday and Tuesday as a second cold front will drop our temperatures back to the chilly/frosty setting by the middle of next week. Going to be a bit of a wet morning for some people heading out the door. The storms just started popping up over the last couple hours. The cold front that will dry and clear us out is trying to move southward through Ohio, but the first half of the day we will be dealing with the rain. By the afternoon we will slowly clear out, but watch out for heavy rain through midday, even small hail being reported. Other than a Flood Advisory where we have had the heavy rain, no severe weather. The clearing will continue overnight into tomorrow with cool temperatures. We should stay dry and slowly warm until Sunday with only a slight chance for rain, 20% chance. A little better chance Monday as a strong cold front will bring chilly weather for the middle of next week. Got to get back to tracking the storms, but grab the jacket and umbrella as you head out the door. Have a good one! Yesterday was a fantastic day. The weather could not have been better, well maybe a couple degrees warmer, but still great. I finally was able to ride my moped at Moped Monday since both bikes are done with the rebuild. I am still tuning the carb and clutch on the Maxi with the Polini so I rode my Magnum. I got a little scared because my temp gauge came in with a max temp of 434 degrees. That is crazy hot and reaching the point of smearing the aluminum piston, but luckily it was only for a couple seconds while climbing a hill. I really love the temperature gauge because I can easily tell when the motor is getting over worked and I need to back off and cool it off a bit. I also may down gear just a little bit to help with the hills around my neighborhood. Anyway we had a rather small group yesterday, but the walking tacos and the ride...amazing. We stopped by the mound in Miamisburg for a little photo-op before I had to head home to get up for work at 1:15AM. I did take my GoPro camera and got video of the riding. I can't wait to put the video on the computer and work on editing our trailer for the moped rally. Today will be even warmer than yesterday. We will warm into the upper 70's today with scattered storms expected later tonight. Some of the storms could be strong to severe due to the warmth to help fuel them as a warm front lifts through here. That will be followed by a cold front by early tomorrow cooling us off for the next few days. Early rain tomorrow pushing south, but cooler with a high of 63. The rain will park just to our south Thursday, but right now it looks like Opening Day for the Reds and Dragons will be dry, but cool with a high of 58. Slowly warming up for the end of the week and our next chance for rain will be early Easter, but the timing still is a little iffy. Ideally the rain would NOT be in the morning since there will be so many sunrise services. So rain tonight into early tomorrow and early Sunday... other than that mild temps and plenty of sunshine for us for the week ahead. Enjoy the warm temps today, stay alert for storms, and have a good one! Yesterday turned out to be a very warm afternoon, but the storms started firing up around 6PM and lasted into the overnight hours. 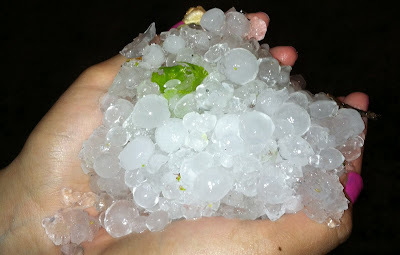 We had some large hail in Preble County and A LOT of it. This photo was sent in from Mary in Eaton, OH. The largest hail reported was 1.25" from several people in the area, while most of the hail was less than an inch. We had a lot of photos sent in of hail-covered decks and hand-fulls of the ice balls. Luckily no major damage, but we could be in for another round of storms tomorrow. It was a rather quiet weekend around Dayton. Luckily no tornado warnings Friday so I did not have to come back into work. Dawn and I went out Friday for a going-away party of a co-worker, Scott Bartles. He was our assignment editor and a really great guy. We also met him Sunday for lunch at Sammy's El Pueblo in Springboro for some AMAZING burgers. After the going-away party Friday we went down to Blind Bob's and watched a fellow moped rider play his last show in Dayton before moving to Illinois for his job relocation. Saturday was pretty laid back and Dawn and I hung out at home and then went out to watch the Buckeyes game at Roosters. While I am sad to see them lose, at least they will not be trampled by Kentucky tonight. Kansas has no chance. Sunday we had lunch with Scott then watched 21 Jump Street. It was nice to have a laid back weekend and just relax; haven't had that in a long time. A few light showers are possible today, but we will clear out later this morning. The early morning rain will be rather light and very spotty. We will see a chance for scattered storms late Tuesday into Wednesday, but then dry out just in time for Opening Day for the Reds and Dragons on Thursday. Rain will be just south of the area on Thursday so we could see a few clouds from that. Staying dry heading into the weekend and temperatures will slowly warm. As far as temperatures, 67 for the high today, 77 Tuesday, 64 Wednesday, then cool Thursday with a high of 57. Back into mid-upper 60's next weekend. Seasonal after a VERY warm March. Dayton averaged a temperature of 53.6 for March, which was 13.2 degrees above normal and the warmest March ever. April is not looking nearly as warm, but I am not going to complain too much about that. Have a good one!